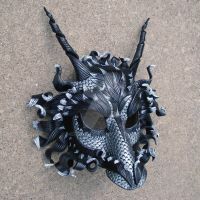 This is the newest version of my "Great Dragon" mask design; done with a realistic snake pattern on the scales. 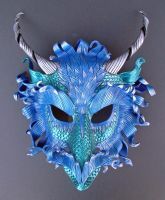 The mask is carved out of several pieces of 8oz leather, three times the thickness of most Venetian-style leather masks. This allows me to carve the leather deeply, but requires me to shape the entire sculpture by hand with no use of molds or armatures. It is painted with colorfast Liquitex acrylics by hand in black, white, and varying shades of brown. I researched snake patterns and used a modified version of a juvenile rat snake for inspiration. The entire mask is then sealed with an acrylic clear coat for durability. This is designed to be a sturdy, wearable piece of art. This daily deviation is featured as part of leatherwork week to raise awareness of this amazing craft. This is my personal favourite colour scheme. Just stunning. how do you twist the horns like that? Thank you...I love your stuff too! Thank you for letting #ArtToBeBought display your work. Congrats again! It is truly worthy of a DD! I more or less have a mask fetish. This is so good. Gorgeous, just gorgeous. I'm also glad no snakes were harmed. Reminds me of Majora's Mask. Good job. I love the detail. This is incredible. That is absolutely strikingly gorgeous. I love the snake pattern with the silver and black. It stands out beautifully. Wow! Congratulations on your DD today! I was thrilled to see your beautiful creation adorn the DA page today! Holy cow!!! That is so incredible!!! Are you selling these? You should be. I know that there is definitely a market for one off masks of this quality, there has to be. Great work! Check the artist description, there's a link to her shop. All your work is great. This is fantastic! Hey, I just saw it got a DD, congrats! This is incredible! I love it! and just realized that leather masks are pretty interesting art category.. all of them are awesome..
Man, they're really into masks this week. The snake pattern really is gorgeous, and your style is ever so strong. I'm trying to see how everything fits together, though - it just can't be made of one piece! True...this design has separate eyebrow and snout pieces, just small ones. The rest is one piece including horns and mane...the detail is all carved. Ah, it was the eyebrow pieces that really got me. I couldn't find how it really worked until now! It's all so smooth. No friggin' way! That mask is totally awesome!!!! So it's all made out of leather? Even he black swirly parts? Man...I had a hard enough time making my paper mache owl mask last year If I could afford the results of your talent, time, and labour, I'd buy one of these in a heartbeat...best friggin' masks I've seen in here. Thank you! Yep, that's all leather. It's a very versatile sculpting medium if you practice with it for a bit. Amazing! I love the snake pattern!! Marvelous work. Now that you're letting yourself create to the limits of your ability with your truly ambitious pieces, I am just stunned at what is possible! Thank you! I'm still poor <G> but at least I'm having fun making really exciting things that I like. Something good is bound to come of that. Right? I think so. Once you can really put all your passion into something, I find that unexpected things happen! Very nice! I love the color pattern . Thanks so much...glad you like it!